Quick post today - gotta get my classes scheduled for the next quarter and finish my new newsletter. Unfortunately, I'm having trouble getting my motor going this morning. 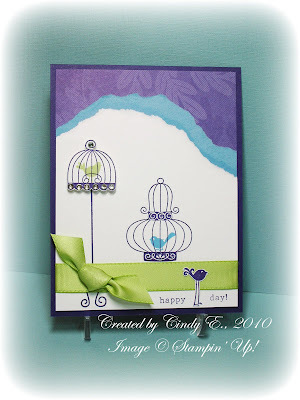 The Aviary stamp set is so versatile, and the birds just crack me up, especially that long-legged one. He fits perfectly into the greeting! I used a Stampin' Write Marker to ink the words "happy" and "day" on the greeting from the SAB Hostess set Picture This, but I'll bet any happy birthday greeting would do....just don't ink the "birth" part of it. Okay, I am seriously just about falling asleep here, and sleepy drool on the keyboard would be bad, very bad. Off to make more coffee. Gorgeous colors together! Great card, love the birds! I don't know how I missed these adorable cards. I love them. I guess better late than not all all. Best Blog Hop Ever & Winner!